Learn about the types of airlocks and requirements in classified areas during pharmaceutical manufacturing. Airlock helps to protect the classified area from the contamination that may occur during the entry and exit of personnel and material. 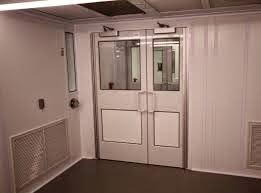 Airlocks are closed rooms having two or more doors between two different controlled areas having different cleanliness levels as class B and class C, class C and class D areas. These airlocks prevent the direct airflow between these areas during the entry of material or personnel. Airlocks are called PAL (Personnel Air Lock) when used for personnel and MAL (Material Air Lock) when used for transferring the material. A. Cascade Airlock: These airlocks are very common having a higher pressure on one side and lower pressure on another side. This prevents to enter dust and contaminants from outside to airlock and from airlock to inner side. B. Bubble Airlock: These types of airlocks have a higher pressure inside the airlock and lower pressure in both outsides. This prevents the flow of air between two areas through the airlock creating a pressure barrier. C. Sink Airlock: Airlocks having lower pressure inside the airlock and higher pressure on both sides of the airlock. This airlock pulls air from both adjacent areas creating a low-pressure barrier. Doors of the airlocks should open to higher pressure side; it will help to close the door. An interlocking system should be provided to prevent the opening of both doors at a time. An alarm should be provided to indicate that one door is opened. It helps to prevent the entry of contamination through the airlocks. Higher air changes per hour rate should be maintained in the airlock, it should be minimum 20 air changes per hour. It helps to remove the contaminants entered from the outside easily. Airlocks should be kept empty, material such as garments, shoes covers etc. should not kept in the airlocks. I have observed it many times in pharmaceuticals keeping these articles in airlocks. Pressure different between airlock and adjacent rooms for certain production rooms must not be 20 pascal. As long as there is a pressure different and can be verified with air pattern monitoring using smoke generator, plus discipline (written in SOP)among the people who use Airlock. is it free to use any type for any design or there is special requirement for each type of air lock ?? Given in figure. Please check. Some non-betalactam solid dosage form plants have PAL& MAL in all process rooms .although all products are not potent products. In outherside some plants doesn't apply this approach .all process rooms without any PAL or MAL. And others Only use one Air lock in each process room . What is the difference between these philosophies. How to select airlock? Any different application for all airlock room?